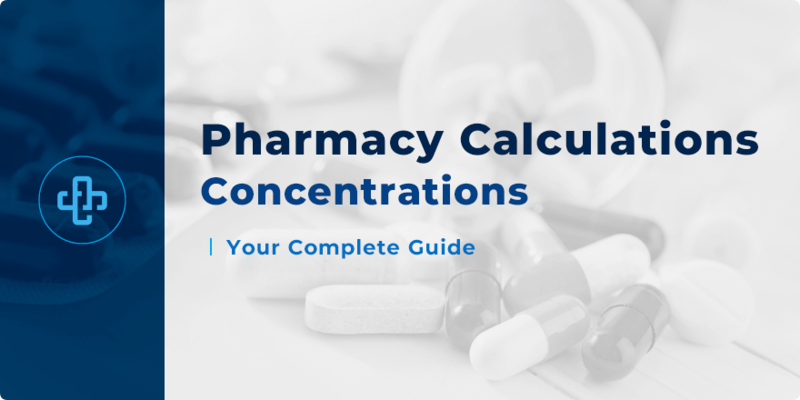 Concentrations | Calculations Guide for Pharmacy Students! As a pharmacy student, you are expected to have a comprehensive understanding of the concept of concentration. Concentrations form the foundation of pharmacy calculations. Knowing how to convert from one concentration to another is an crucial skill that every pharmacy student must possess. Today, we review the fundamental facts about concentrations that you need to know. Pharmaceutical preparations are often composed of many and varying ingredients – known as excipients– which are contained within a vehicle. These excipients can take various forms – some solid, some liquid – and, as such, these different concentrations need to be taken into account. Medicines need to be defined by their concentration – as it is this concentration that lets a clinician know how much drug is present. This is why understanding concentrations is important. It’s also important, though, to know how to convert one type of concentration to another. In the case of a solid ingredient in a liquid vehicle, the ratio is expressed as weight in volume or w/v. If a liquid ingredient is formulated into a solid vehicle, the ratio is expressed as v/w. If both drug and vehicle are liquids, it is expressed as v/v. If both the drug and the vehicle are solid in nature, the ratio is expressed as w/w. For ratio strengths, parts per million and percentage strengths in w/w or v/v – the same units must be used. Your colleague hands you a preparation that contains 1,200mg of sodium chloride dissolved in water, producing 120mL of solution. Express the concentration of this solution as amount strength. Solution concentration can be expressed as an amount strength in units of mg/100mL, mg/mL, g/100mL, g/L – and so on. Though there are other methods, we can use proportional Sets to discover what the amount strength would be in terms of mg/mL or g/mL. Z represents the number of milligrams of sodium chloride in 1ml of water. Why did we represent the water as ‘to 100mL’ above and not ‘in 100mL’? This is because sodium chloride is dissolved in water and made up to 100mL. 1,200mg of NaCl + 100mL of water produces more than 100mL of solution. As a result, the quantity of water needed is less than 100mL – the sodium chloride causes displacement. Another factor, such as the strong concentration of some drugs such as alcohol, causes a contraction in volume when dissolved in water. From the proportional sets above, we can see that z=12mg. Given that 12mg of NaCl is in 1mL of solution, we represent this as 12mg/mL. This is the amount strength we are looking for. We also know that there are 1,000mg in a gram, so we can also represent this figure as 0.012g/L. Ratio strengths are expressed as a ratio in the form of 1 in r. The corresponding fraction would have a numerator of 1. The current agreed convention is that when a ratio strength represents a solid in a liquid, we use grams for the solid and millilitres for the liquid. 1 in 500 KMnO4 in water is a solid in a liquid such that its amount strength is represented as the weight in volume (w/v) ratio. This means that the solution contains 1g of potassium permanganate made up to 500mL with water. 2L of an aqueous solution contains 50mL of ethanol. Express this as a ratio strength. As this solution is a v/v, we need to ensure that the same units are used before we can express this as a ratio. 5g of product contains 250mg of sulphur in yellow soft paraffin. Express this as a ratio strength. Given we are dealing with g and mg, this is going to be a w/w ratio. As per the previous example, they must be using the same units. From the set above, we can deduce that the ratio strength is 1 in 20 w/w. Parts per million (ppm) is used to denote concentrations where the ratio of ingredient to product is very small. It is the equivalent of a ratio in the form of p in 1,000,000, or a fraction in which the denominator is 1,000,000. Fluoride in a water supply is expressed as parts per million w/v. Fluoride supplements should not be taken if fluoride levels in the supply exceed 0.7 parts per million w/v, according to the BNF. Express this as a ratio in mg/L. By convention, 0.7ppm w/v can be represented as 0.7g in 1,000,000mL. Thus, the question asks us to make the ratio mg/L. – Convert 0.7g into mg to get 700mg. – Convert 1,000,000mL into L to get 1,000L. We can see, then, that ppm is the same as mg/L – that is to say, they are interchangeable concentrations. If the concentration of fluoride is 0.25ppm w/v, how many litres would contain 1mg of fluoride? Using proportional sets, we learn that we’d need 4 liters to contain 1mg. A cream contains 12g of drug X made up to 100g with cream base. What is the percentage concentration? Both units are the same – in grams. As we have 12g in 100g, the concentration is 12% w/w. Express 1 in 500w/v solution of potassium permanganate as a percentage. We can divide 500 by 5 to give 100. Proportionally, then, we divide 1 by 5 to give us a fifth, or 0.2. Hence, x = 0.2 – giving the percentage of potassium permanganate as 0.2% w/v. Express 900mg of sodium chloride, made up to 100mL with water, as a percentage. There is 0.9g of sodium chloride in 100mL of solution, thus the percentage is 0.9% w/v. A morphine sulphate injection contains 10mg/ml. What is the percentage concentration? As usual to express the value as a percentage, we need to convert the number of milligrams in 1mL to grams in 100mL. There is 0.01g of morphine sulphate in 1mL of solution – meaning there is 1g in 100mL of solution, or 1% w/v. Let’s consider a general case – let the amount of ingredient be ‘a’ and the amount of product be ‘b’. Let ‘p’ be the amount in 100 parts (the percentage concentration), 1 in r to be the ratio strength and ‘m’ to be the number of parts per million. This table shows the relationship between the different expressions of concentration. Using these relationships, it’s possible to convert from one form of expression to another. A solution contains 20mL of ethanol in 500mL of product. Express the concentration as a ratio strength and as a percentage strength. The question asks us to find two concentrations. Let p be the percentage strength and let 1 in r be the ratio strength. If r = 25, then by ‘spotting’, we can see that p would have to be 4. Ratio strength is 1 in 25v/v. A solid ingredient mixed with a solid vehicle has a ratio strength of 1 in 40. Find the percentage strength and the amount strength expressed as grams per gram. A solution contains a solid dissolved in a liquid. The ratio strength is 1 in 2000w/v. What is the percentage strength and the amount concentration expressed as mg/mL? By convention, a ratio strength 1:2,000 w/v means 1g in 2,000mL. The percentage strength is the number of grams of ingredient in 100mL of product. As the question asked for the amount concentrations to be expressed in mg, we convert 0.0005g to 0.5mg. Concentration of 1 in 2000w/v can be expressed as 0.05%w/v or 0.5mg/mL. A liquid ingredient mixed with another liquid vehicle has a concentration of 5% v/v. Find the ratio strength and the amount strength expressed as mL/mL. 5% v/v can be expressed as 5mL of ingredient in 100mL of product. The ratio is 1 in 20v/v and the amount strength in mL/mL is 0.05mL/mL. 5g of solid ingredient is added to 45g of base. Find the percentage strength, the ratio strength and the amount strength expressed as g/g. Remember – for weight in weight and volume in volume, the product is equal to the sum of the vehicle and the ingredient – in this case 5+45=50g of product. By placing “10” into the above table, we can learn – by “spotting” – that r = 10 and, from there, that a = 0.1. This is a simple example but the principle remains the same for more challenging examples. Values of p and b will be known allowing ‘a’ to be calculated. How many milligrams of aluminium acetate are needed to prepare 500mL of a 0.03% w/v solution? Aluminium acetate is a solid, expressed as a weight – in this case milligrams. The vehicle is a liquid, expressed in millilitres. By convention, 0.03% w/v means 0.03g per 100mL so each 100mL contains 0.03g of aluminium acetate. Converting 0.03g to milligrams = 30mg. Let ‘x’ be the number of milligrams of aluminium acetate in 500mL. By ‘spotting’ we can find that x = 150mg. In the solution of 100mL we have 30mg of aluminium. If we have 500mL, then, we need 5 times as much aluminium mg to make 150mg. When the final concentrations of product is expressed as a ratio strength, the following proportional sets can be used to calculate the amount of ingredient needed to produce a known amount of product. In this situation, r and b will be known – allowing ‘a’ to be calculated. What is the amount of potassium permanganate in 300mL of a 1 in 25 solution. In addition, what is the percentage strength of the solution? We need to know what ‘1 in 25’ means; and by convention it refers to 1g in 25mL. There is 1g in 25mL – all we need to do now is find a common divisor. 300mL/25mL = 12 – meaning we have 12g of potassium permanganate in solution. Alternatively we could have used sets – a formal set up of the above process. We were also asked for the solution’s percentage strength. Now that we know that the solution has 12g of potassium permanganate in 300mL, the percentage must be 12g/300mL or 4% w/v. Knowing what concentrations are, how they are used in pharmacy and how you can convert from one kind to another, are essential skills for the aspiring pharmacist. Though this guide to concentrations in pharmaceutical calculations is by no means exhaustive – it equips you with the fundamental knowledge and skills that you need to know. Pharmacy calculations don’t have to be difficult. With the right approach, you can breakdown each question to its essential components and work out, logically, the correct path.